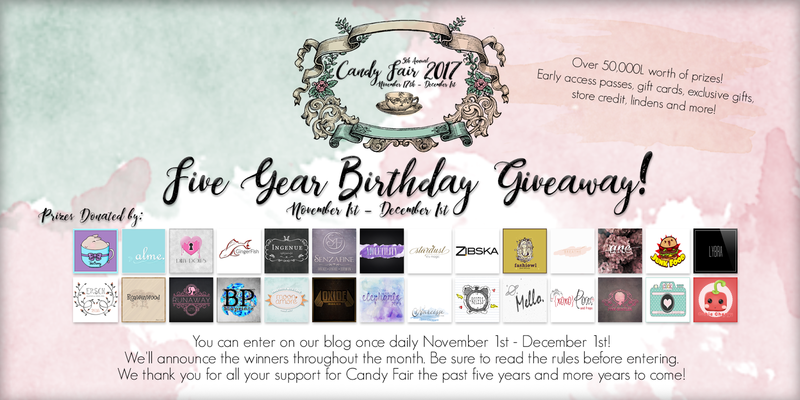 Candy Fair 2017 Five Year Birthday Giveaway! To celebrate Candy Fair running for five years straight we wanted to give back to everyone for supporting us, shopping and joining in on the fun of Candy with us every year! This year we have had 28 stores participating in the fair donate lindens, gift cards, exclusive gifts and store credit to giveaway! We want to thank them for all the donations which total up to more than $50,000L in value! To enter please visit our birthday giveaway page here: Candy Fair 2017 Five Year Birthday Giveaway!